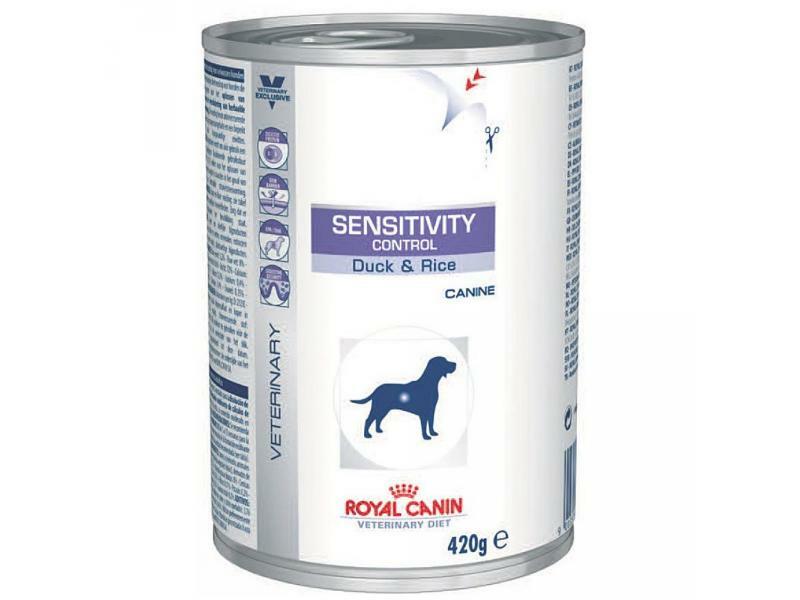 Royal Canin Sensitivity Control is a specially tailored diet for dogs suffering from food intolerances, allergies, inflammatory bowel disease, diarrhoea or colitis. The ingredients have been carefully selected to cater for the needs of dogs with more delicate digestions, combining nutritious and delicious duck and tapioca, known to not exacerbate digestive sensitivities. The diet also contains a healthy blend of fish oils, beet pulp, prebiotics and sugar to provide all the essential nutrients needed for health, growth and vitality. Omega 3 fatty acids and added zinc will help promote a glossy coat and support skin and its natural defenses. Free from lactose and gluten, reducing the risk of gastrointestinal or dermatological reaction. SENSITIVITY CONTROL is a complete dietetic feed for dogs formulated to reduce ingredient and nutrient intolerances. Selected protein sources: duck or chicken. Selected carbohydrate source: tapioca or rice. Feed for 3 to 8 weeks. If signs of intolerance disappear, this diet can be used indefinitely. It is recommended that a veterinarian’s opinion be sought before use. Selected Protein - A limited number of protein sources helps reduce the risk of food allergies. Skin Barrier - A patented complex to support the barrier effect of the skin. EPA/DHA - Fatty acids to help maintain a healthy digestive system and a healthy skin. The following tables show the recommended daily feeding guidelines (grams per day). Fresh water should be available at all times. Below are some recent questions we've received regarding Royal Canin Veterinary Diets Sensitivity Control Dog Food, including answers from our team. The vet thinks pancreatitis a mild form, had tests and blood tests they have recommended. royal canin, have tried this before in a tin my dog wouldnt eat it. Can you rec. which one be the best as they look like they are for different conditions.I have used viovet for quite a while with my Cavalier Chloe who passed away at Christmas and I know Viovet will be better priced than my vet if I can get her to eat it. I think Viovet is a great company and rec. you to everyone. My dog is Penny a Westie, aged 9 yrs. For pancreatitis I would recommend Royal Canin Gastro-intestinal Low Fat dog food or equally Hills i/d dog food (ideally the low fat version). Hi, my pointer has really bad diarrhoea which the vet feels is due to too much protein in her diet from a mixed source. She is very sensitive and I've tried lots of different foods supposedly for this but still she gets upsets at times, as the food she has is causing such an upset I wondered how quickly I can change her over to the royal canine sensitivity - when she gets upsets she stops eating and then when she feels better she guzzles the tinned royal canine sensitivity so I wondered if I could stick with that and then slowly introduce the dried royal canine rather than using anymore of the protein rich food she is obviously intolerant to. In my opinion, dogs usually have trouble like this because of the types of protein given, not the total amount. Being carnivores, dogs are in fact designed to consume large amounts of protein and it is often pointed out that the large amounts of cereal they tend to be given amount to very unnatural diets and might well be responsible for problems themselves. However it is true that most dogs do in fact digest cereals well and unnatural or not, they seem to work OK for most dogs. The precise mechanism whereby sensitivities and intolerances develop are poorly understood and commercial pressure from the big manufacturers clouds the issues. Senstivity control works partly by having different protein sources which are well digested and as long as your dog is well suited to these proteins, all should be well. (The dried form is based on tapioca and duck, the wet is chicken or duck and rice..) I would switch your dog onto any new diet gradually, by adding a little to the former diet, then over 7-10 days, gradually change the proportions until she has switched completely. Most dogs do fine this way. My dog has got a shunt and this food has been recommended but my other dog loves and just wondered if it was okay for both dogs to eat the same. Though this food is usually designed for dogs suffering from food intolerances and allergies, it would be fine to feed to a normal dog without these problems. Does renal dog food come in pouches ? We do sell Royal Canin Canine Veterinary (Clinical) Diets Renal Dog Food Wet » 40 x 150g Pouches. You can find this by searching this quick find number 157919. What is the flavour of the 7kg bag of royal canin sensitivity food? The main flavour of all the dry food is duck. The sensitivity diet is intended to be given to dogs with intermittent loose stools where there is no obvious cause. It does indeed often help and should be suitable to try. If your puppy is a bit greedy it is very important also not to give too much food. Keeping him a bit hungry for a few days will give the digestion a better chance to get back under control. Overloading it with lots of food makes it more difficult. If in doubt, feed a bit less. For a few days this will do no harm. You can increase the amounts gradually if things are going well. If problems still persist, you should return to your vet however.